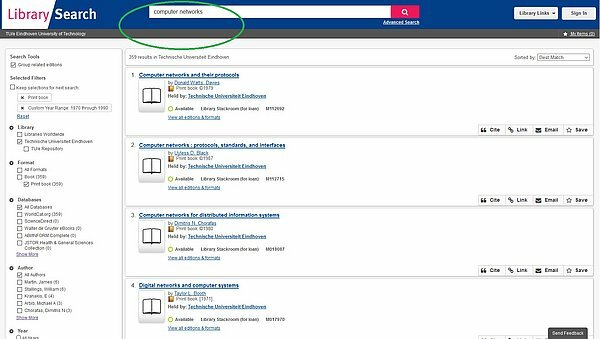 If LibrarySearch indicates that a book is on loan you can make a reservation using the button 'Place Hold'. When the previous borrower returns the book it is set apart for you and you will be sent an e-mail that you can collect the book at the library information desk. On your loan account in LibrarySearch you can check for which books you have made reservations, and cancel these of you wish by using the button 'Remove'. Books and reports from the Library Stackroom may be requested via the Place Hold button. Follow steps below and read about delivery. You may request books from the Stackroom via LibrarySearch if you are registered as a member of the TU/e Library, and collect the books personally at the Library information desk. Items requested from our Stackroom are delivered twice weekly: on Tuesday and Friday. They will be held ready for collection for 5 working days at the information desk of the Library, MetaForum building. You will be notified via e-mail when items you requested are ready to pick up. 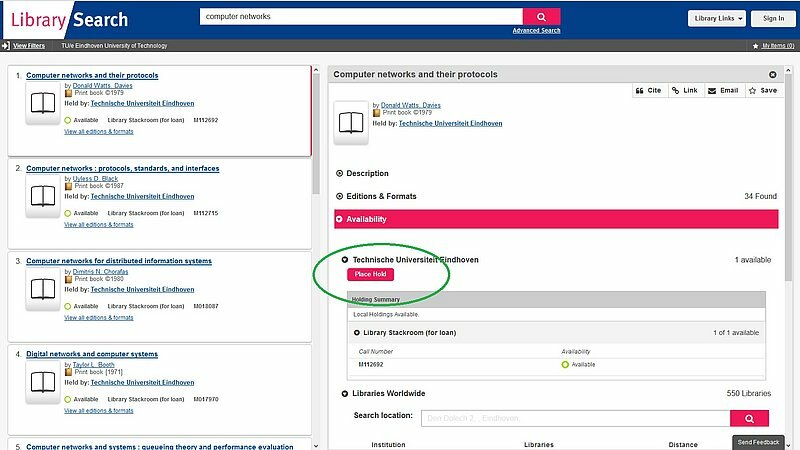 To request copies of articles in journals that are held in the Stackroom, use the document delivery request form. Articles are delivered in pdf format. This is a free service. Library users from outside TU/e who are registered as members may request photocopies of journal articles from the Library collection via e-mail address below. This is a paid service.